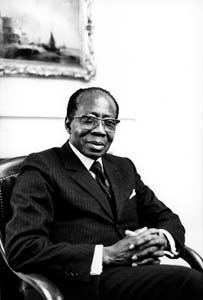 Here is my translation, from French to English, of The Hurricane, a poem by Léopold Sédar Senghor, the Senegalese poet who was also President of Senegal and is today remembered as the Father of the Country. In translating Senghor, I have tried to reproduce respectfully the voice and style of the original. And the hurricane uproots in me leaves and futile words. But peace dries up the tornado, as the winter season leaves us. When the sand falls upon the dunes of the heart. Servant, cease your statuesque gesture and you, children, your games and your laughter of ivory colored smiles. The flame that lights up the night, like a column and like a palm tree. Kiss my lips with blood, Spirit, and blow upon the strings of my kôra. That it may uplift my song, as pure as the gold of Galam. Et l’ouragan arrache en moi feuilles et paroles futiles. Mais paix sur la tornade sèche, sur la fuite de l’hivernage! Quand retombe le sable sur les dunes du coeur. Servante, suspends ton geste de statue et vous, enfants, vos jeux et vos rires d’ivoire. La flame qui illumine ma nuit, comme une colonne et comme une palme. Que s’élève mon chant, aussi pur que l’or de Galam.